Hey! I just got a notice for a giant tomato contest for anyone interested in looking into submitting one of your BIG tomatoes this year. 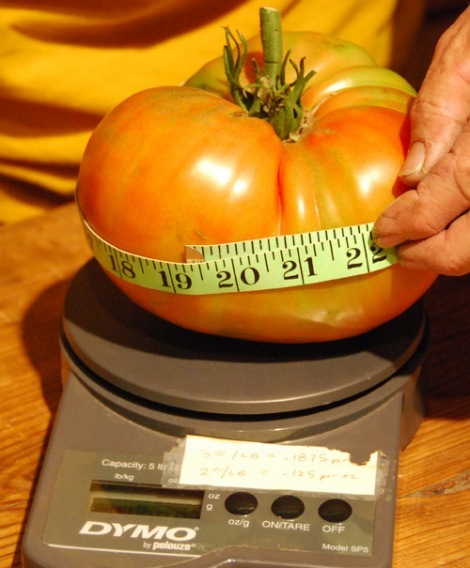 The website-PlantYourOwn.com is running its 1st ever giant tomato competition. Click here for details. The contest is simple……just grow a big tomato!!! Signup ends March 1st, 2012. I might have to join! This entry was posted in general, GIANT TOMATOES and tagged 2012 giant tomato contest, giant tomatoes, giant2012 giant tomato contest, growing giant tomatoes. Hi Angela-Take this winter to read my posts on tomatoes. You can find all of them under the right hand column called ‘GARDEN TOPICS’ under ‘TOMATOES’-then you will only get my posts pertaining to tomato growing. It may help plus amend the heck out of your soil, I believe if I remember right, you just started a homestead last year. Good Luck this season!